Fun right? 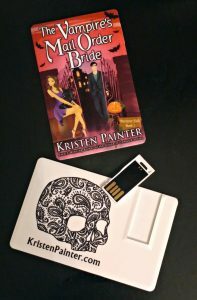 They have the cover for The Vampire’s Mail Order Bride on one side and my logo on the other. As you can see, the USB stick fits right in the back. They’ll be randomly up for giveaways on my Facebook page on Thursdays (giveaway day!) so if you want one, keep an eye out! ← Looking for the Official Nocturne Falls Reading List?